What is the first thing to learn in art school? "Art can be anything." The second thing? "Learn to draw." With 101 Things to Learn in Art School, artist and teacher Kit White delivers and develops such lessons, striking an instructive balance between technical advice and sage concepts. These 101 maxims, meditations, and demonstrations offer both a toolkit of ideas for the art student and a set of guiding principles for the artist. 101 Things to Learn in Art School offers advice about the issues artists confront across all artistic media, but this is no simple handbook to making art. It is a guide to understanding art as a description of the world we live in, and it is a guide to using art as a medium for thought. And so this book belongs on the reading list of art students, art teachers, and artists, but it also belongs in the library of everyone who cares about art as a way of understanding life. How do we read a photograph? In this rich and fascinating work, Graham Clarke gives a clear and incisive account of the photograph's historical development, and elucidates the insights of the most engaging thinkers on the subject, such as Roland Barthes and Susan Sontag. From the first misty "heliograph" taken by Joseph Nicephore Niepce in 1826 to the classic compositions of Cartier-Bresson and Alfred Steiglitz and the striking postmodern strategies of Robert Mapplethorpe, Clarke provides a groundbreaking examination of photography's main subject areas--landscape, the city, portraiture, the body, and reportage--as well as a detailed analysis of exemplary images in terms of their cultural and ideological contexts. With over 130 illustrations, The Photograph offers a series of discussions of major themes and genres providing an up-to-date introduction to the history of photography and creating a record of the most dazzling, penetrating, and pervasive images of our time. "This is a book about making art. Ordinary art. Ordinary art means something like: all art notmade by Mozart. After all, art is rarely made by Mozart-like people; essentially—statistically speaking—there aren't any people like that. Geniuses get made once-a-century or so, yet good art gets made all the time, so to equate the making of art with the workings of genius removes this intimately human activity to a strangely unreachable and unknowable place. For all practical purposes making art can be examined in great detail without ever getting entangled in the very remote problems of genius." This unique textbook is an invaluable tool for students in any art course requiring critiques. 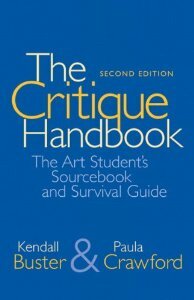 The Critique Handbook is an excellent resource both for beginners and more experienced students.This text was written to address an existing gap in text offerings for art students. Although the critique is central to all art programs, there have been no textbooks or comprehensive guides to help students navigate the critique process. The Critique Handbook fills the need for such a book. 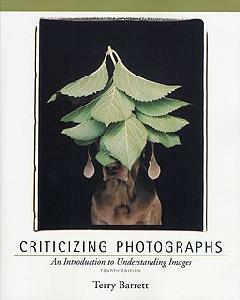 This brief text is designed to help both beginning and advanced students of photography better develop and articulate thoughtful criticism. Organized around the major activities of criticism (describing, interpreting, evaluating, and theorizing), Criticizing Photographs provides a clear framework and vocabulary for students' critical skill development. The fourth edition includes new black and white and color images, updated commentary, a completely revised chapter on theory that offers a broad discussion of digital images, and an expanded chapter eight on studio critiques and writing about photographs, plus examples of student writing and critique.